How does C.O.P (coefficient of performance) affect operating costs? COP or Coefficient of Performance is a term specifically used in heat transfer to describe the efficiency of any device transferring heat. All heaters are compared to a standard form of heating called resistance heating. Resistance heat is transferred by passing water over a red-hot coil (like in your hot water tank or toaster oven). This form of heating is constant and has a COP of 1 (one). The COP of all heaters are compared to this standard, so a COP of 6.21 means that the heater is 6.21 times more efficient than resistant heating. If you compare that same heater to one with a COP of 4.14, a heater with a COP of 6.21 would be 50% more efficient. The COP of a heat pump generally measures between 5 and 6, which translates to an efficiency rate between 500% and 600%. The higher the number the less it will cost to operate. Heater size is measured in BTU output. BTU stands for British Thermal Unit and is standard for measuring heating capacity. A BTU is the measured amount of heat output that the unit will produce and may vary with the ambient temperature and humidity levels. It takes 1 BTU to heat 1 lb of water 1° F.
The energy efficiency of heat pump swimming pool heaters is measured by coefficient of performance (COP). The higher the COP number, the more efficient. However, there is no standard test for measuring the COP. Therefore, you really can’t compare the COPs of different models unless you know that the manufacturers used the same test for each model. For example, the same heat pump will operate at a higher COP when the outside air temperature is higher. 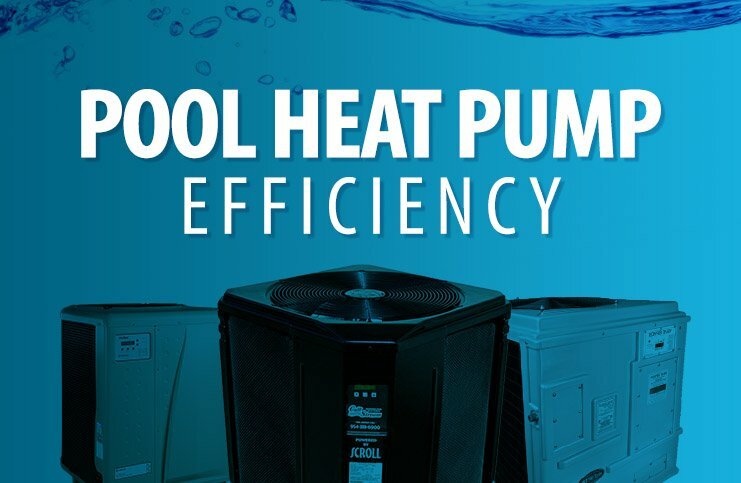 Typically, manufacturers measure the COP by testing a heat pump pool heater with an outdoor temperature of 80ºF and pool temperature of 80ºF. COPs usually range from 3.0 to 7.0, which converts to an efficiency of 300%–700%. This means that for every unit of electricity it takes to runs the compressor, you get 3–7 units of heat out of the heat pump. Today, you’ll find some gas pool heaters with 89%–95% efficiency.